As mentioned in the clothing blog, we recently went to a wedding. It was Sophie’s sister, Carole who got married. It’s funny because Sophie shared with me about Carole getting married and how important it is that we attend. Carole is the person who made our first Cameroonian clothes in 2010 and since she did that culturally puts us in a relationship with her and since we are in a relationship with her, we therefore need to attend her wedding. Sophie brought an invitation to us. I (DeAnna) looked at it and set it on our counter where we keep invitations and things we need to remember. Two days later Sophie asked for the invitation back. I was puzzled since the invitation had the name of the church and we would need that to get to the wedding, so I asked her why. She responded that they only had five printed and it was just for me to look at and copy the invitation’s information and give it back. So I copied the information and gave it back for the next person to have their opportunity to be invited officially. The day was upon us, we had our wedding clothes on and were ready to leave the house and head in the direction of the church. It’s very hard to find places here because there aren’t addresses and you can’t just pull up directions using the internet. As we headed in the general direction, we asked several people along the way. We received conflicting directions and continued heading straight. After being on the road for about an hour, we saw a woman walking along the side of the road wearing a dress with the same fabric that we were wearing. We were thankful for the identifying fabric. We stopped and asked her if she was in route to the wedding. After she told us she was, she hopped in the car to show us the way and she got a ride to the wedding – a win, win! This entry was posted in Cameroon and tagged addresses, Cameroon, Wedding. Bookmark the permalink. Sharing invitations? Amazing. Glad you found the church on time. It seems God provided an angel for you at just the right time. Your blogs are such a joy to read. From car mechanics in the courtyard to celebration fabrics and shared invitations. 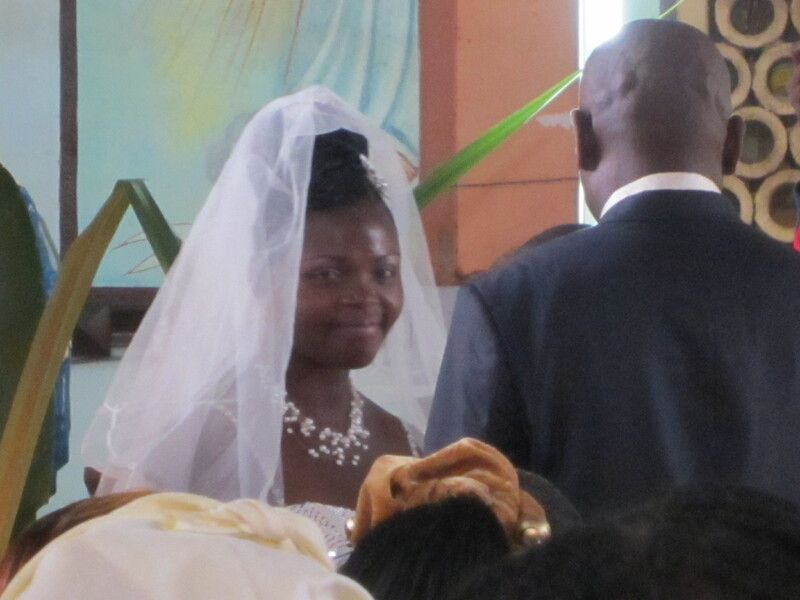 You bless us daily by sharing life in Cameroon.